What’s New on the Sidewalk? Not much is new, really – although there’s often a surprise or two on a Saturday. 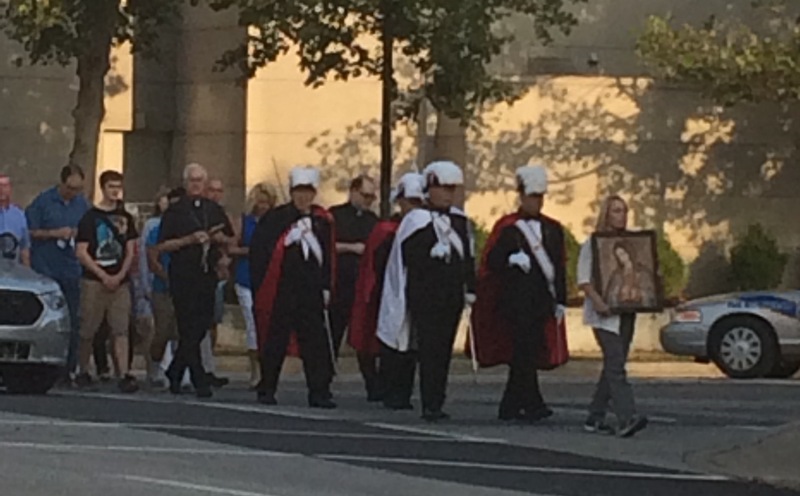 This week, we had Catholics on parade, and the Archbishop was there – so they had a police motorcade – and they brought the Knights of Columbus. Someone thought they were from the Renaissance Faire, but no. I am not trying to be snarky about the Knights but they do look a little medieval, right? And the swords might be a bit over the top. Yes, swords – see the silverish things hanging down beside them? Swords. Grown men. Broad daylight. In front of the abortion clinic. The Kentucky State Council is dedicated to growing the Order throughout the state of Kentucky to further the vision of our founder, Fr. Michael J. McGivney and the Evangelization of our Catholic Faith. The Order was founded on the principle of Charity, specifically to care for the widow and orphan of a Brother Knight. Later the principles of Unity and Fraternity, as well as Patriotism were added. The everyday actions of the State and local councils are a means for Knights to live the Corporal and Spiritual Works of Mercy. It is through the implementation of programs that exemplify these principles that the Kentucky State Council will continue to grow the Order. The State Council will lead by example and through both action and dialogue inspire its members into action. But the Knights are in fine fettle, standing across the street from the abortion clinic. I hope those swords have a dull point, like epees, but I’m not close enough to tell. Actually that is not my thumb in the pictures here either. In other news , the ongoing conflict between our regular Catholics and the AHA people (Abolish Human Abortion) flares up today. The Catholics, who create the gauntlet of people lining the sidewalk, mostly just say the rosary. AHA folks bring their microphones and preach the whole time – loudly. Makes it difficult for the Catholics to hear themselves pray – so today, we hear a sudden blast from a referee whistle, and a lot of yelling at the preacher. But it is just a momentary disruption and no blows are exchanged. As I’m crossing the street with a client, one of the AHA guys joins us. He’s wearing a microphone and actually starts broadcasting at the client as we cross the street. That’s a first for me, and I’m sure for her too. Doesn’t seem like you would need amplification if you’re standing right next to someone. I’m hoping he’s not going to make a habit of it – it just seems like a new level of rude. But lots of things are the same. They still hang their signs on the fire hydrant – I guess they think the police just meant they couldn’t do it that one day. Dominic still yells, “Murder – Murder in the first degree!” Donna still gives her little hand wave, motioning for the clients to come out of the clinic. So much happening there, it’s such a circus, and seems like such a big deal. And then I read Ky Born’s story about her abortion experience and I’m reminded that the walk up the sidewalk is a tiny part of the “getting an abortion” process. All this chaos is one tiny part. That’s a good perspective to hold on to. This entry was posted in abortion access, Anti-Choice protesters, Escorting and tagged Abortion access, EMW, Escorting, Louisville KY, stigma by Fausta. Bookmark the permalink. Catholics have done there best in supporting many charities but the .church’s stand on reproductive rights has been reprehensible. Ah, the Knights of Columbus. One of those Catholic fraternal organizations, that, like the Catholic clergy, has been rumored if not proven to be quite capable of pedophilia (I’ve heard second-hand accounts–first-hand accounts are hard to um, ferret out). 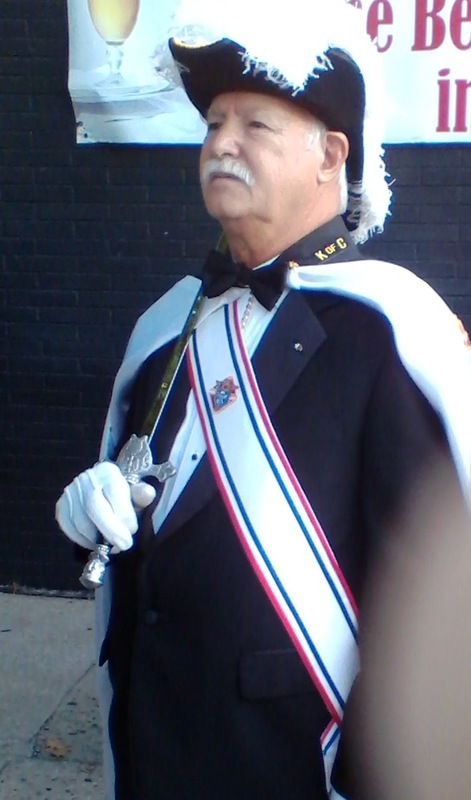 A friend recently told me that he is now part of his church’s KofC chapter. He is troubled by their stance on reproductive choice and justice, in no small part because of the very thorough knowledge base held by women in his life (and a few men). I recently re-heard a 2009 bit on “Does the Catholic Church represent a force for good in the world?” The panelists were an African bishop, an English former M.P (member of Parliament) who is an unapologetic Catholic, Christopher Hitchens, and Stephen Frye. You can imagine the drubbing that religion got at the voices of the latter two. The arguments in favor of the Church were logically quite empty, to say nothing of their emotive vacuousness. The Knights of Columbus are certainly becoming an argument against the question of whether the Church is a force for good. As a former Catholic, I’m quite sure that the Knights of Columbus have done lots of great things, and honestly, any fraternity is likely to have some pedophiles in it. But I don’t appreciate them bringing their knightliness and their swords to the abortion clinic, that’s for sure. And the Catholic church’s stand on reproductive rights has been reprehensible – that’s a huge part of why I’m not Catholic anymore. Thanks for reading and for commenting! Good grief! That’s a new one. Knights! Oh my! 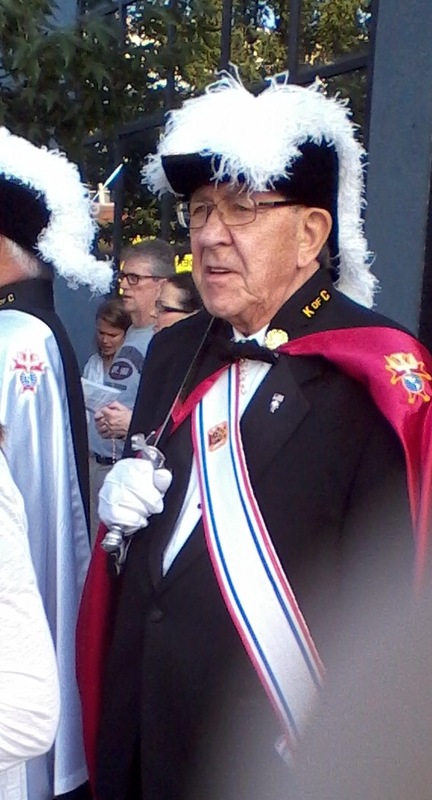 When our knights of columbus have their parades we call it the Skunk Hat Parade. Out is quite a sight.